Love music? Love working with young people? Interested in organizing a music program for youth in your community, but not sure what it could look like? You’ve come to the right place. Over the years, we’ve worked with many leaders who have started creative initiatives in their communities that get young people involved in music, often in conjunction with something else engaging like the outdoors, visual arts, or technology. They’re all different, but they all have some common threads (such as, we’ll just say it, being awesome). Would it surprise you to know that Copenhagen itself, that shining eco mecca of robust and teeming protected bike lanes – bike highways, really – was not always so? That up to the 1960’s, Copenhagen, too, according to People for Bikes, was just as jam-packed with smelly cars as the rest of the developed world is? Well, yes. It was that late in the game that the bike-heaven of the world turned it around, creating vast networks of protected bike lanes and clearing public squares of cars. Think we can do it, too? Signs point to yes. In fact, lots of the cool kids already are. New York is doing it, Chicago’s doing it, Minneapolis is doing it. Memphis, a city particularly dear to our hearts, is doing it. And here’s some very exciting news: up next to the plate is a city that for many of us probably still calls up images of SUV’s packed with outdoorsy gear, rather than of bicycles. 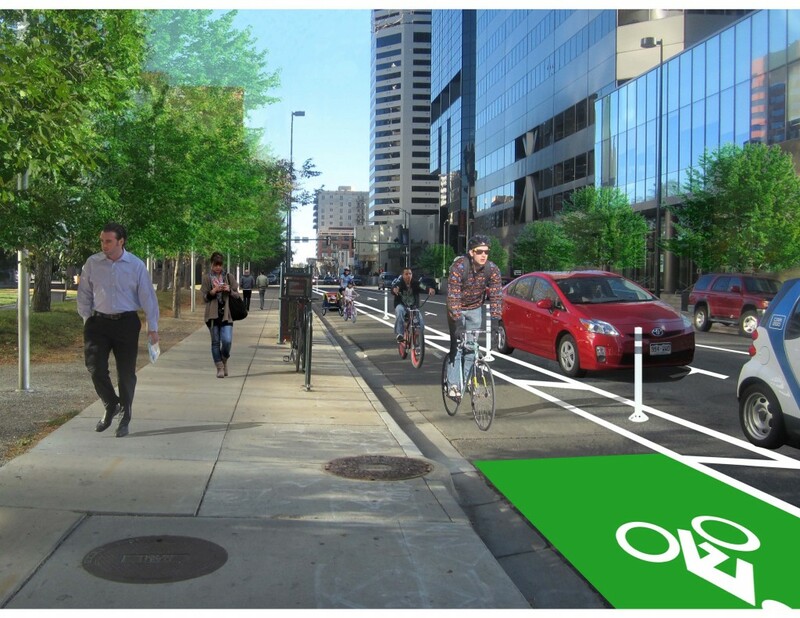 Time to throw out your old ideas about the mile-high city; cyclists, meet the new Denver. By this summer, two major protected bike lanes will have opened, with many more to follow. The imminent changes are thanks in part to Aylene McCallum, Transportation & Research Manager at non-profit Downtown Denver Partnership, and her D.D.P. colleagues. About a year ago, McCallum and her boss approached the city of Denver to say that they planned to crowd-resource money to design some protected bike lanes for downtown. City officials immediately jumped in to partner on the project, and to greatly expand its scope. In an incredibly streamlined and speedy fundraising push, McCallum personally approached local businesses that stood to benefit from the increased bike and foot traffic the protected lane would bring them. She approached, in other words, people who were already stakeholders in the project, but didn’t know it yet. The money was raised in no time, at which point a community meeting was held, and a straw poll taken to determine which major roads residents wanted to tackle first. McCallum says it was the most fun she’s ever had at a public meeting; the poll was a hit. Arapahoe Street won, and a summer 2015 opening is slated for the new protected lane, along with it’s sister lane, which will run on a parallel street, in the opposite direction. McCallum is herself exactly the kind of Denver resident and hopeful cyclist that she wishes were out pedaling on the roads. She’s what she calls an “interested but concerned” cyclist. She’d like to bike to her work in downtown Denver, but with two young children and a husband at home, it simply isn’t worth the risk. The city still doesn’t quite feel safely broken in for cyclists. Looks like McCallum and her many interested but concerned peers won’t have to wait long; maybe we’re not as far behind Copenhagen as it seems. For a map of the new protected lane site, and lots more info, check out the Arapahoe Street Protected Bike Lane ioby campaign page.